Iraqi-born Zaha Hadid's has beaten hundreds of other architects to design a new cultural centre in London. Her Architecture Foundation building creation is described as "solid concrete ribbon wrapped around a full height glazed space at its centre". The £2.25m project is due to open close to the Tate Modern on Bankside near the South Bank next year. Ms Hadid's design was picked from a shortlist of eight contributions on Wednesday. The architectural centre will incorporate exhibition space, events space, the Architecture Foundation's office as well as a bar. Rowan Moore, director of the Architecture Foundation, said: "Zaha Hadid won because of the way her design encompassed the range of spaces required by the brief, and made them into a convincing architectural whole. "It is a powerful, not to say un-missable building, but one that also allows for quieter and more intimate spaces. "Her design is also a brilliant response to a challenging site, surrounded by large buildings." 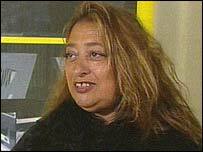 Hadid became the first woman to be awarded the prestigious Pritzker Prize for Architecture, considered the highest award in the profession, in 2004.